Pixel Qi better watch out for Liquavista is here to steal some of its thunder. As per the latest e-reader news coming in, Liquavista now has the technical know how that made it possible for them to develop multi-mode panels that company sources revealed will make their screens equally viewable in both indoor and outdoor light conditions and is several notches higher than a similar offering from Pixel Qi. Named LiquavistaVivid, it offers transflective displays that would render monochrome reading experience of the highest order while also allowing for TV like high quality images complete with vibrant colors. Further, the technology is much less demanding on the battery in comparison to regular LCD. In fact, Liquavista has said its technology can contribute to a 4 times increase in battery life than traditional panels. Based on electrowetting technology, it can deliver monochrome reading experience having high brightness while at the same time, the screen can also deliver a vivid hi-fidelity video display having rich colors. All this, while also being kind to the battery. Liquavista is actually developing three technology platforms, LiquavistaBright, LiquavistaColor and LiquavistaVivid, which the company plans to make ready for integration with suitable products that might take up the better part of 2011. 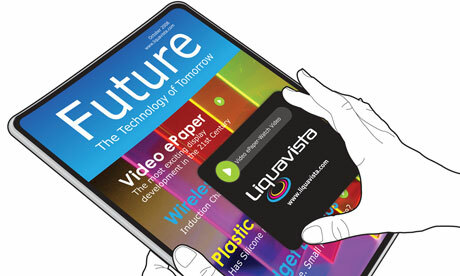 Liquavista claims it would be easy for hardware manufacturers to absorb the new display technology, as it’s fully compatible with all prevalent equipment and processes used for manufacturing LCD display at present. So it would be easy for manufacturers to convert all existing manufacturing assets to produce the kind of display that would make for a whole new viewing experience combined with enhanced performance. Products where the technology may find application is future include e-readers, notebooks as well as Tablet PCs. However, on the flip side, the LiquivistaVivid displays are yet to reach the stage of maturity that Pixel Qi can enjoy as of now. So while Pixel Qi display panels are ready to make its entry into the markets soon, the same unfortunately can’t be said of LiquivistaVivid. You’ll have more on this here as and when they become available along with all the latest e-reader news or Slate/Tablet PC news. You can also catch up with a lot more info from the E-Reader or Tablet PC segment in our monthly Good E-Reader Magazine. Sounds to me like a Pixel Qi knockoff with lots of marketing speak wrapped around it. Meanwhile the Pixel Qi team has been very open throughout the whole development process. I'm prone to trust the folks who don't have anything to hide.